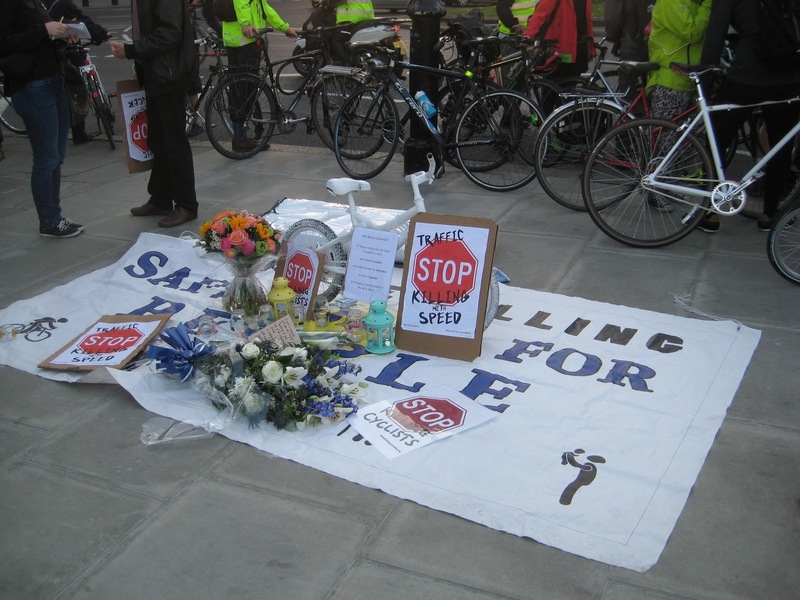 Tomorrow, Monday, sees a vigil and die-in at Bank junction in London at 5:30pm to mark the deaths of Ling Tao, killed there on 22 June by a tipper truck, and Clifton James, killed the night before on Forward Drive, Harrow by a car. There has already been a large protest at Bank organised by London Cycling Campaign on Wednesday morning. Whether or not you went to that one, I urge you, whatever your usual mode of transport, if you are interested in making London a more civilised city thast tries harder to protect its people from the dangers of the roads, to attend the vigil and die-in tomorrow. I've attended this year two similar events in London organised by the group Stop Killing Cyclists. This group has developed, under the leadership of the admirable Donnachadh McCarthy, into a powerful and well-organised 'conscience' for road safety in London, operating in the capital in a complimentary manner to the London Cycling Campaign, separate from it and with different methods, but similar goals. Where we used to get ghost bikes placed by a few anonymous souls at the site of a cycling fatality, and little else, we now get a significant demonstration with speeches from the relatives of bereaved and from campaigners, and then a protest that involves people lying in the road with bicycles for several minutes. 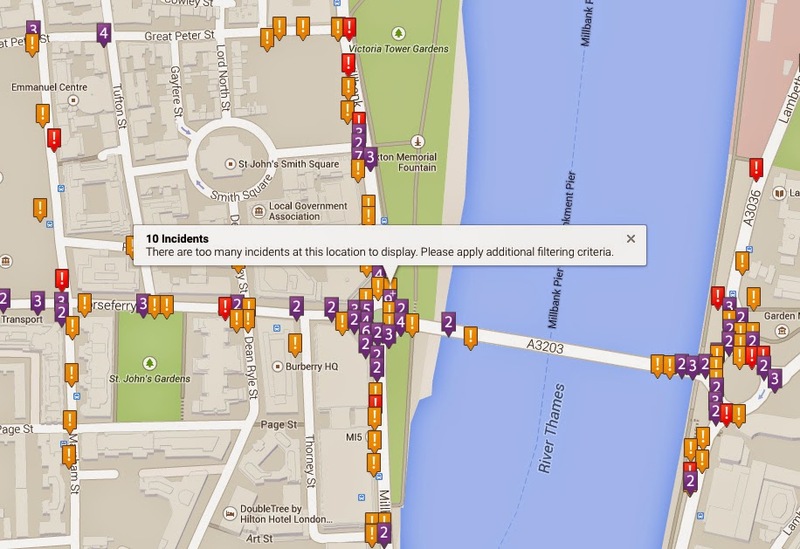 We now have this very time there is a cycling fatality in London. It is systematic, and London's authorities now know it will happen every time, and that the movement is likely to grow until these unnecessary deaths stop. I did not attend the event that marked the death of Esther Hartsilver in Southwark on 6 June, so I'll not discuss that one here, but I will write about the previous two Stop Killing Cyclists events, both of which I attended, commemorating Michael Mason and Moira Gemmill, as they illustrate starkly and respectively the twin issues the UK must address to make cycling (and walking) safe: road justice and infrastructure. Michael Mason was given fatal injuries on 25 February 2014 by a driver on Regent Street who simply ran him over from behind. He was a cyclist with half a century of experience doing everything right, and he was just struck down on a busy central London street by a driver who just claims she 'didn't see him' and can't explain why. The police believe they have insufficient evidence to prove a charge of causing death by careless driving, and so no action has been taken against the driver at all. No case has been sent to the Crown Prosecution Service. Of course a jury may have taken the same view as the police, but at least a trial would have tested this view. The view will probably now be tested by a private prosecution of the driver by the relatives of Michael Mason, that is being funded by the Cyclists Defence Fund, to which I urge readers to donate. If this is allowed to stand without further legal or political challenge, the position seems to be that any good and responsible cyclist cycling in every way within the law can just expect to be be killed by a driver running them over from behind, there need be no rational explanation of the incident, and the driver may just walk away from such a killing with no legal procedure following and a blameless record. The implications are quite horrific for all who cycle on our roads. Sadly police incompetence in this case continued beyond this point. An announcement that had been made that the the case was in fact going to be referred to the Director of Public Prosecutions, which was seen as most likely a response to the protest and publicity, was then reversed, without apology, and with a further effect on the family that can only be imagined. The vigil and die-in held on 20 April for Moira Gemmill was even more impressive. Moira, an acclaimed museum designer distinguished for work at the Museum of London, the Victoria and Albert Museum and the Royal Collection was the fifth cyclist to be killed riding in London in 2015, the fifth to be killed by an HGV, the fourth by a construction lorry, and the fourth woman. There was an additional big issue in this case, though, apart from the usual one of the danger of lorries and their drivers' blind-spots and the apparent statistical extra vulnerability of female cyclists. The Millbank and Lambeth Bridge roundabout, where the crash occurred, is known as an especially dangerous junction. If you have ever tried cycling round this roundabout you will know why it is one of the most dangerous in London. It has heavy traffic volumes and is a terrible design that encourages speed and aggression. It was identified as a junction requiring urgent work by Transport for London in 2012. It was also a focus of a conference in October of that year nearby at Church House in Westminster entitled the Love London Go Dutch Cycle Conference, sponsored by the Kingdom of the Netherlands and involving the London Cycling Campaign, Dutch consultancy firm Royal HashkoningDHV, Transport for London and others, and attended by then Under Secretary of State for Transport Norman Baker. There was a working party consisting of campaigners and Dutch and British roads experts sent on the morning of the conference to examine the Millbank roundabout and come up with better designs. The better design proposed was a Dutch-style roundabout with a priority cycle track and parallel zebra crossings. There was discussion on this in the afternoon. I remember the bafflement of the Dutch representatives who couldn't quite understand the objection to their tried-and-testyed standard Dutch design from elements of the local contingent that it would not be able to cope with the number of vehicles that the roundabout currently does. They understood that to create a safe cycling environment and an attractive city for walking you have to reduce traffic to reasonable levels with designs not calculated to maximise motor throughput! They couldn't, at a fundamental level, understand why people would actually wish to have in the historic centre of a city and close to a world heritage site a motorway's worth of polluting, noisy, aggressive, fast and dangerous cars and HGVs. Transport for London subsequently went away on worked on designs for the roundabout, and came back with something one-one much liked. It was a classic two-track provision compromise with shared pavements for "less-confident cyclists" and on-road cycle "awareness-raising" markers for the others, with raised tables under zebra crossings at the entrances and exits. It was roundly condemned by LCC and the Cycling Embassy of Great Britain (but not by CTC, who seem to think "tightening-up corner geometries" was all that was required). It appears Westminster council had their own reasons for opposing TfL's proposed changes, though what their argument was never publicly made clear. 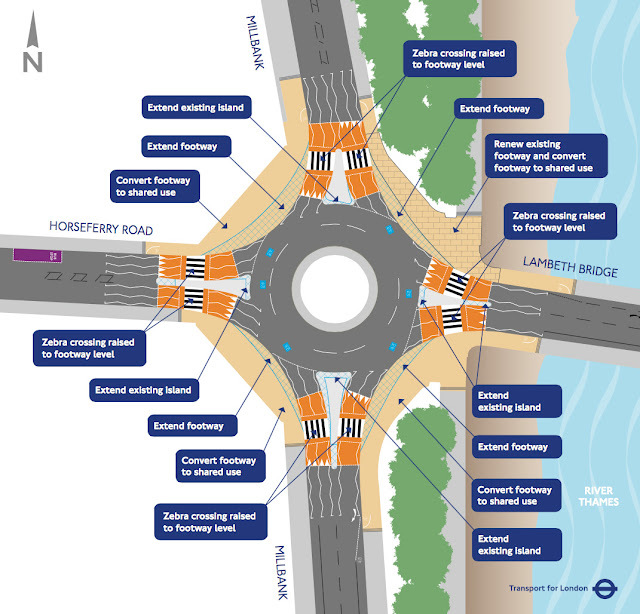 TfL announced finally that they would not processed with the proposed changers, and would not do anything else to the roundabout in the short term, but that they would trial a Dutch-style roundabout at the Transport Research Laboratory in Berkshire. The trial roundabout was indeed built in Berkshire in 2013, but no results from this trial have yet been published. Following the publication of The Mayor's Vision for Cycling in London in March 2013, Andrew Gilligan, the Boris Johnson's Cycling commissioner, often publicly suggested that temporary emergency changes could be made to known danger-spots for cycling on the road network, but no such action was ever taken, anywhere in London. There was clearly a lack of political support for this common-sense view. I can't report on the speeches that were made at the vigil and die-in for Moira Gemmill on 20 April, as the demo was so huge I could not get within (amplified) earshot of them. 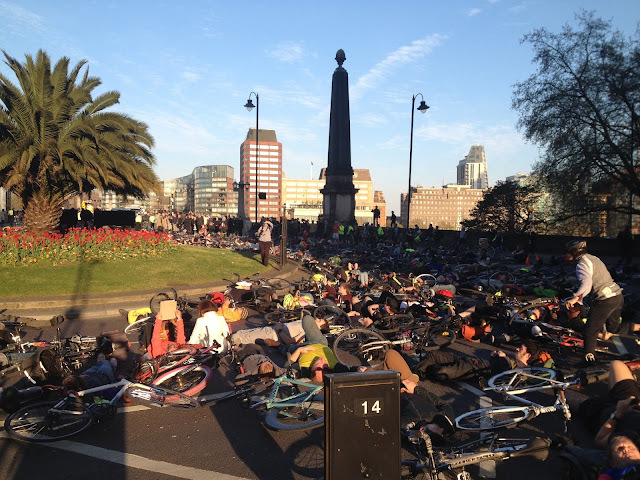 During the die-in the entire junction became a human and bike interlaced carpet, the low spring sun shone, and the tulips in the centre of the roundabout went a deep shade of crimson. There was a special quaity of silence, and this brief tweet with accompanying picture I made seemed to strike a popular chord, as it had 126 retweets and 47 favourites. Sea of cyclists on the Millbank roundabout commemorating Moira Gemmill during the die-in on 20 April. Maybe Westminster or TfL thought that "Dutch-style roundabout" meant planting lovely red tulips on it. Hints are about now that Millbank roundabout may finally get a re-working as part of the Mayor's 'Better Junctions' programme, but that cannot now happen before 2016, and in the meantime it remains as deadly as ever. Our next task will be to build a computer traffic model to assess what is likely to happen if traffic is prevented from crossing the junction for example in certain directions or times of day. Information from pedestrian and cycling movements will also help to develop solutions. This is likely to be a big piece of work and will take some time to complete but it is very important to have credible options for alterations to the junction. We hope to have this work completed by early 2016. So that's just building this model by early 2016. No actual building of anything on the ground. The latest from the Corporation suggests they will not have finished building whatever new design they eventually come up with before 2020 or even 2021! Rather than just building a hugely complex model from scratch to find out what happens when a junction is closed to motor traffic, couldn’t the City just do it, on a trial basis? If the result is genuine chaos, then the trial can quickly be abandoned. There are good reasons for thinking a trial of this kind – closing roads at Bank temporarily – would not result in chaos. The main one is that the area is ringed by major arterial roads, composed of London Wall to the north, Aldgate and Tower Gateway to the east, and Upper Thames Street to the south. All are designed to carry large volumes of motor traffic, and all lie very close to Bank itself. These are the roads that should be carrying through traffic; the area around Bank should, realistically, only be carrying private motor traffic that is accessing the area. Certainly, the Bank junction should not be carrying through motor traffic in an east-west direction, as there are two major roads to the north and south – just a few hundred metres away – that were built for this purpose. So – why not just try this? Try it now, rather than spending eighteen difficult months building a model from scratch. You’ll get results that correspond to the real world, and much more quickly! One can draw a sharp contrast between the London approach and that of New York under Transportation Commissioner Janette Sadik-Khan, with her mantra "Do bold experiments that are cheap to try out". While New York is certainly not yet any kind of cyclists' or pedestrians' paradise, the radical changes achieved in locations like Time Square and Broadway with quick and temporary infrastructure used to experiment with concepts that can later be made permanent represent a possibility that seems anathema to the lumbering structures of London government. While these structures, the boroughs, the City Corporation, TfL, and the Department for Transport, continue to quibble, delay, and argue about what should be done to known dangerous junctions, the dead bodies metaphorically pile up. Ying Tao, a 26 year-old management consultant was crushed at Bank last week, the eighth cyclist to be killed in London this year, the seventh by an HGV, the sixth by a construction lorry, and the sixth woman. About 12 hours earlier 60 year-old Clifton James became the second male cyclist to be killed in London this year, dying from head injuries caused by a car on Forward Drive, Harrow, a bad suburban rat-run on which traffic regularly exceeds the 30mph limit, furnished with two confusing mini-roundabout junctions on which drivers often fail to give way to cyclists. This death is quite local to me, and in fact I have written about the corridor on which Mr James was killed before, pointing out the uselessness of painting "awareness-raising" cycle symbols on rat-run urban roads. It's funny how these places that the cycle campaigners and bloggers keep writing about as dangerous but which don't get changed are the places where we see the deaths. I've written also before (2011) about King's Cross, where the same type of cycle fatality has been repeated in the same place, likewise (2013) the Holborn gyratory. While we have seen tinkering, we still have seen not seen substantive changes that remove the specific dangers in these locations. It is all getting quite tedious. I was speaking to a friend yesterday who is a professional scientist and a cyclist, but not involved in cycle campaigning. He asked me, "Why can't we analyse the incidents in which cyclists die, and put in place measures that prevent the repeated occurrences of the same kind of incident? There is a body of information out there, there must be inquests on every death, why isn't this used more systematically?" Why indeed. I've written long ago about how our system of inquests in the coroners' courts is treated as a mere ceremony of legal closure typically achieving little in road death and other cases. More enlightened societies, like Sweden, have a 'Vision Zero' concept where they do attempt to carry out an investigation, analysis and remedial process systematically for every crash, with the ultimate aim of reducing road deaths to zero. In the UK it seems priorities lie elsewhere. The best way to challenge this is to make a big fuss on the streets after every death until priorities do change. The stark language of the "Stop the Killing" movement takes its cue from the successful Dutch 'Stop the Child Murder' campaign of the 1970s. I believe we will eventually succeed with this in the UK as well, but we are far behind. The more people we get to events like tomorrow's vigil, the more publicity we generate, the harder time we give the politicians and civil sevants responsible for the current mess, the sooner we will approach our own Vision Zero and also make London and other British towns and cities safe, pleasant and attractive place to cycle and to walk. There is a more detailed history of the Millbank roundabout saga by Alex Ingram here. I hope that tonight's die-in will be the last and SKC will be able to disband & consider it a job well done. A small point with regard to Michael Mason. The victim-blaming with regard to bright clothing also happens with pedestrians - the STATS 19 form filled in by the MPS after collisions has a box for this with pedestrians as well as cyclists. Glad you're picking up on road justice issues. I echo your call for people to donate to the Cyclists' Defence Fun so that we can do something re-the Michael mason case. This is not being vindictive, it's just part of changing what many think is socially acceptable with regard to motor vehicle use.